Current online information is also becoming increasingly important in production planning. 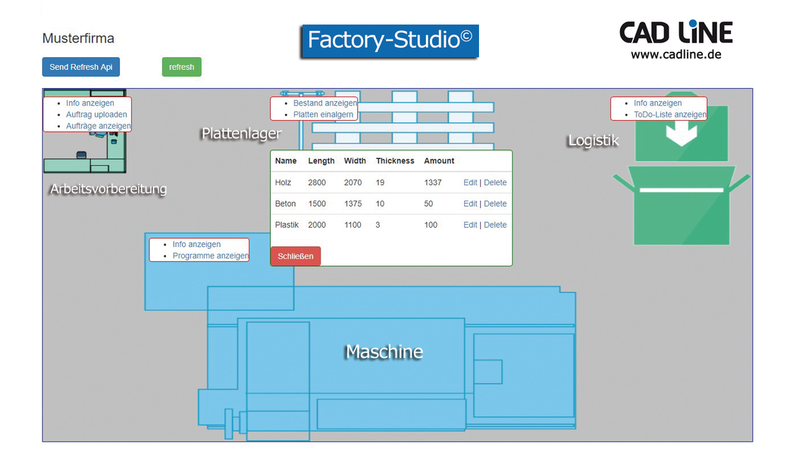 Factory-Studio © is a new cloud-based software for production control and warehouse management that will greatly simplify and improve the day-to-day operations of small to medium-sized businesses while still being an "affordable" solution. Users can access the data in profile-controlled and secure online mode (passive hotlines) or actively exchange data with the factory studio (active hotlines). Once the work preparation provides a new production order, this data is available to the manager, e.g. on his tablet and the operator immediately available. Factory-Studio © runs in the cloud and access is in the browser, making it available on all platforms (PC, tablet, smartphone).